Beyoncé's little sister and fellow singer Solange turned 31 Saturday. While she spent it away from her family—in England, where she performed at the 2017 Glastonbury Festival, their mom Tina Knowles Lawson shared the sweetest birthday message to her youngest child...complete with some details about her birth. "Happy Birthday my beautiful baby girl❤️31 years ago today you entered this world (when YOU got good and damned ready to come) !10 days late! We were all in love!!!" she wrote. You've been walking to the beat of your own drum every since!!" she continued. "I don't know anyone who is as headstrong and determined to do it their way , no matter the consequences. I admire your courage , Boldness, intelligence , beauty , refusal to conform to others definition of (traditional beauty , your kindness, loyalty, love of family , great mom skills, fashion sense , work ethic , activism. I could go on." 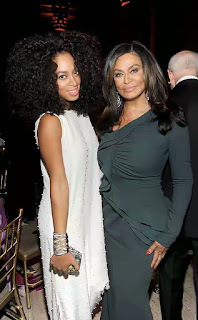 Solange has a 13-year-old son, Daniel, from a previous marriage. Tina also shared a heartwarming story that gives insight into how Solange was as a child. "The Asst. principle called me when you were in the 6th grade and said you started a petition to discipline a teacher because she continuously allowed a student to harass and disrupt the class and keep the other kids from learning!" Tina said. "She said you were disruptive and too grown, at which i said 'go Solange' I was as proud as I could be! I told her so. You were always lite years ahead of your time. We are always here and got your back !! I love you with all my heart!!!" 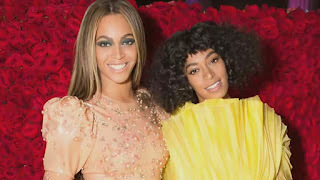 Tina also shared Saturday a throwback video showing her and Beyoncé, 35, lifting up Solange playfully on the set of Saturday Night Live last year, when she performed on the show. Solange smiles and protests, "I'm 30 years old!" Tina said at the time that they "have been picking her up like this since she was 10 yrs old. ""Happy birthday my baby Girl Solange Knowles Fergurson❤️ now you are 31 and we are going to pick you up again when we see you!" Tina wrote Saturday. "Because in Mariah's voice 'you will always be my baby' in this this case OUR baby."